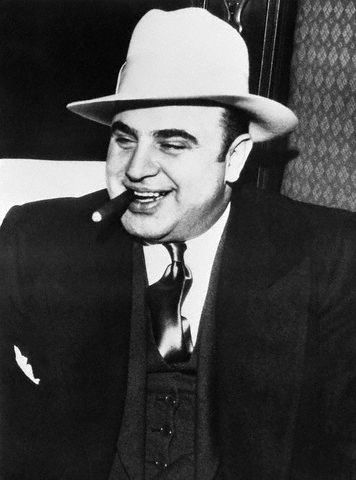 Alphonse Capone was an organized-crime gangster from the early 1920s to 1931. He is and was famous for smuggling alcoholic beverages into Chicago during the Prohibition era, bribing government officials, and running both prostitution and gambling rings. He is, oddly, also famous for what is now known as "Al Capone's vaults," which were underneath the Lexington Hotel in Chicago (a.k.a. "Capone's Castle"). It was rumored that Al stored great riches there, and, some said, bodies. I have a personal connection to Al's vaults because I saw the their unveiling LIVE on the television broadcast The Mystery of Al Capone's Vaults--a greatly-hyped special. It was 1986, and Geraldo Rivera stood with cameras rolling outside the main vault, dragging out the suspense until I thought it would kill me. I felt that anticipation mostly because I expected them to find my lost socks in there, but I digress. Ness and his Untouchables could not prove that Capone was behind so much of the Chicago crime of that era, so they schemed to get him on tax evasion. It worked! Al spent the years 1931-1939 in prison. He was released in 1939 to go home to die. His syphilis caused both mental and physical deterioration, and they didn't expect him to live long. Al Capone's vaults on live television! Go look at Al's Wiki Page. It's a keeper. You may also be interested in the movie The Untouchables with Kevin Costner playing Eliot Ness and Robert De Niro playing Al Capone! Source Articles and Sites: Wikipedia; Alphonse Capone (1899-1947); Good Reads, Al Capone Quotes; YouTube, Al Capone's Vaults; and The Mystery of Al Capone's Vaults, Wikipedia.